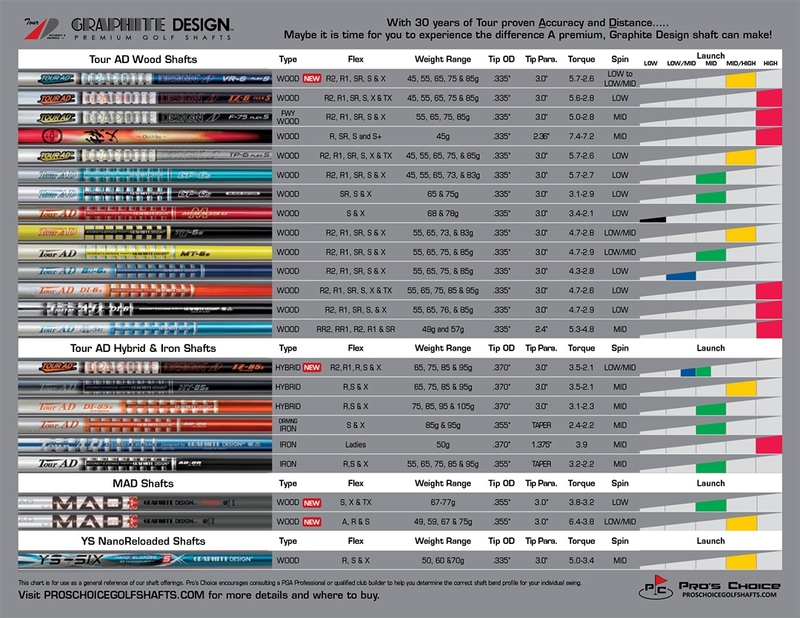 The team in the R&D lab at Graphite Design Japan went all out when designing the new Graphite Design MAD wood shafts. A challenge was issued to them to design a shaft that would alleviate the ill-fated golf ball flight issues that results in a lack of Maximum Accuracy and Distance. Accepting the challenge, they went to work in an effort to develop a cure. The new Graphite Design MAD shaft is their response. Available in two strengths, the Graphite Design MAD Standard strength wood shafts are available in a 45g A and R Flex, 55g R and S Flex, 65g R and S Flex and a 70g S Flex and is designed for the intermediate to advanced players. The Graphite Design MAD PRO strength wood shafts are available in 65g S, X and TX Flex and 75g X and TX Flex and is designed for the advanced to professional players with higher swing speeds. Make an appointment with your local professional golf club fitter and request that he write you a prescription for a new Graphite Design MAD shaft with Torayca T1100G in order to cure your ball flight issues that may be holding you back from achieving Maximum Accuracy and Distance. Graphite Design MAD with Torayca T110G – it’s just what the Doctor ordered! TORAYCA ® T1100G carbon-fiber pre-preg with NANOALLOY ® technology for increased stability in the mid to tip region and unsurpassed feel. Premium, ultra-thin, aerospace quality carbon fiber materials. Designed to promote Mid to Mid/High launch angles with Low/Mid to Mid ball spin rates. Ultra-premium, high modulus, aerospace quality carbon fiber materials. Designed to promote Mid launch angles with Low ball spin rates.